Engineering has forever been associated with Sheffield the City, Sheffield the people. Right at the cutting edge of technology and innovation, Sheffield has carved a reputation as being a pioneer in engineering with advancements evolving rapidly. With some of the biggest global engineering companies such as Boeing and Rolls Royce making a move back to Sheffield, we invested several million pounds in our Olive Grove Campus to ensure that we continue the tradition of developing high-skilled, innovative engineers. The workshops and teaching facilities you will be studying in rival the very best, and replicate those that you will use out in industry with the latest machinery and CAD software. A career in engineering really can be as diverse or as specialist as you desire. Our courses in Engineering, and Electrical and Electronic Engineering help you go further into highly technical careers in the development of aerospace technologies, the latest in low carbon and renewable energies, as well as looking into modern day manufacture of materials such as steel. Engineering is inventive, it’s creative and is ever influenced by new, ground-breaking technologies like VR, 3D printing, drones, robotics and nanotechnologies. At The Sheffield College we pride ourselves on our links with high-profile employers. The engineering department works closely with Liberty Specialist Steels and Sheffield Forgemasters to meet their training requirements. This relationship enables us to improve our provision so that you’re learning the exact skills that your future employer will be looking for, with plenty of opportunities for you to go on work placements and learn from industry specialists. All of our tutors at The Sheffield College have one thing in common - passion for their area! Our engineering tutors come from a wide variety of backgrounds, many having worked in the industry before becoming tutors. This means that not only do they possess expert knowledge of their chosen engineering specialism, but they can also pass down the professional skills you'll need for a successful career in engineering. At The Sheffield College we pride ourselves on our links with high-profile employers. The engineering department works closely with companies such as Liberty Specialist Steels and Sheffield Forgemasters which enables us to improve our provision so that you’re learning the exact skills that your future employer will be looking for. It also allows us to bring in visiting guest lecturers, get employer input and feedback on assignments and projects, and also provides an opportunity for our students to visit external companies so that they can see how the engineering skills they're learning in the classroom are translated into the workplace environment. Our Engineering courses are housed at our Olive Grove Campus, which we’ve recently invested nearly £7 million in to provide you with workshops and teaching facilities that rival the biggest companies and all the latest equipment that you’d find in all the workshops around the world. This means that by learning with us, you’ll be familiar with industry standard technology and equipment and be ready for the workplace. Olive Grove houses our automotive and motor vehicle suites, plumbing workshops and engineering classrooms and workshops. It also has a canteen and Learning Resource Centre on site as well, so you don't have to go far to get your lunch or your textbooks! At The Sheffield College we pride ourselves on our links with high-profile employers such as Liberty Specialist Steels and Sheffield Forgemasters. These relationships enables us to improve our provision so that you’re learning the exact skills that your future employer will be looking for, with plenty of opportunities for you to go on work placements and learn from industry specialists. The engineering sector is a huge employer, both regionally and nationally, so you should be well placed to find a job once you finish your journey with us. 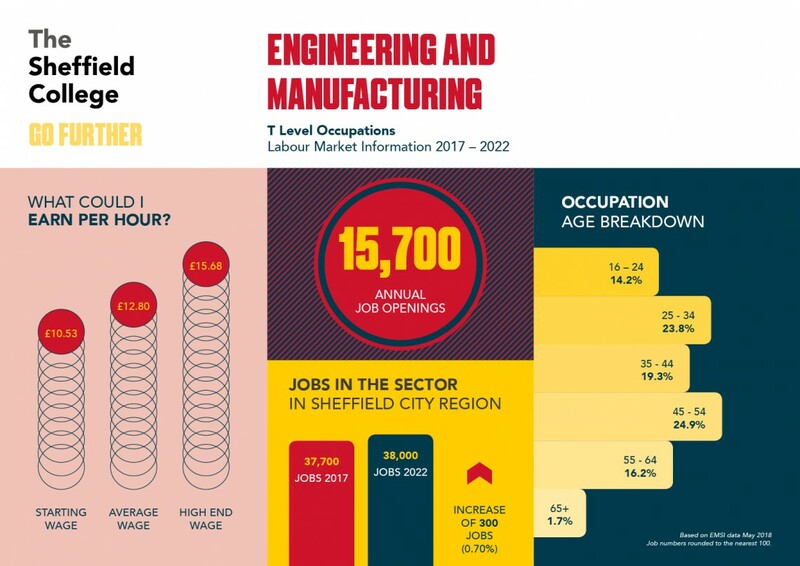 There are set to be an increase of 300 jobs by 2020 in the Sheffield City Region alone, with almost 16,000 job openings each year. Plus with starting wages at around £10.50 per hour, career prospects in the engineering sector are pretty strong! For more information about job roles, average wages, local vacancies, CV tips and more, you can access our online careers toolkit, Career Coach. "This year involves more workshop and hands-on work which I'm really enjoying."